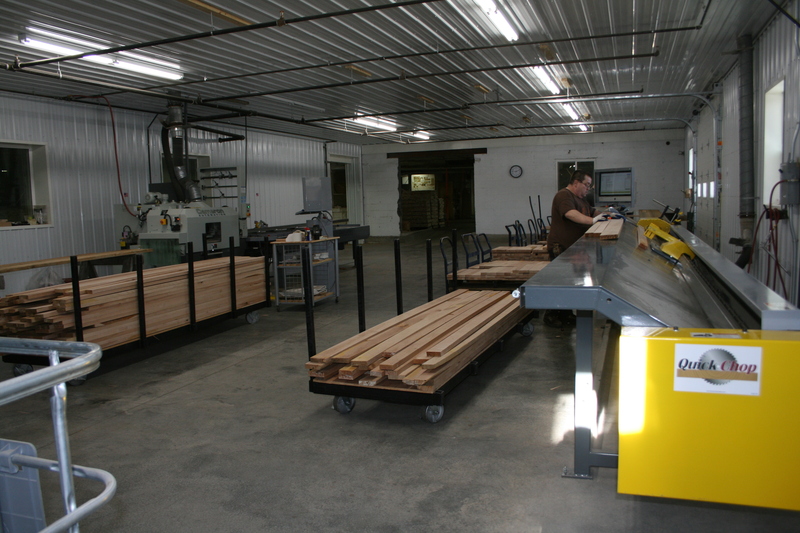 The ripsaw cuts boards parallel to the grain, usually sawing along the board length. In the traditional crosscut-first operation, the objectives of manual ripsaws are to manufacture parts of specified width; remove manufacturing defects and wood characteristics unacceptable in the final product; and produce a straight edge suitable for gluing. These objectives need to be achieved while minimizing the amount of waste generated. The ripsaw operation is the major defecting process in a crosscut-first rough mill, so the volume of wood loss is greater than elsewhere in the rough mill. Recovery opportunities often are found in woodwaste placed on the hog belt. Let's take a look at some practices and tools that can improve yield recovery at the manual ripsaw operation. Minimize edge trim. Excessive edge trim greatly contributes to reduced yield at the ripsaw. Edge trim should be reduced to no more than the thickness of the saw blade. The initial edge at the ripsaw can be just sawdust in rough mills that have well-maintained saws and flat stock. Ideally, the wood removed should be just enough to clean up the board's edge. Place kerf inside the defect. The saw cut should be made through the defect's edge, not through the clear wood next to the defect. Obviously, consideration must be given to the acceptability of sloping grain that is common around knots. Accurate ripping, possible with the tools described below, can result in considerable yield improvements and material cost reductions. Fixed widths and random width parts should be ripped together. Ripping only fixed-width parts (also called solids or specific widths) results in a lot of waste because multiples of the desired part width seldom equal the board width. Yield improves if you rip random width parts for panel glue-up from the same length board sections as the fixed-width parts. Here are some ripping examples to show some of the yield improvement ideas introduced. Throughout these examples, remember that the two main goals of the ripsaw operation are to remove defects and size parts to required widths, but that each saw kerf contributes significantly to the amount of waste produced at the ripsaw. Example 1: In the first example, the stock to be ripped is a completely clear, six-inch-wide section (see Figure 1). Fixed-width parts 2-1/4 inches wide and random-width strips are required from this particular length. This board section may be ripped several different ways, as shown in Figure 1a, 1b and 1c. Considering Figure 1a, the first rip straightens the outside edge. The second cut produces one 2-1/4 inch fixed-width part, while the third cut produces another. The final cut straightens the outside edge on the remaining narrow, random-width strip, which will be edge-glued into a panel. Figure 1b shows a slightly different approach to ripping this same board. Before any parts are removed, the two outside edges are straightened with the first and second rips. This method is somewhat safer than that shown in Figure 1a since it avoids ripping a narrow random width by itself. In both examples the same part volume is produced, resulting in a part yield of 87.5 percent for both cases ([2-1/4 + 2-1/4 + 3/4] ÷ 6). Yet another approach can be used to rip the board shown in Figure 1c. In sawing random-width parts at the ripsaw, make an effort to avoid generating narrow, random-width strips. Narrow strips can be out of square, and the effort in handling and gluing narrow strips may exceed the cost benefit gained from the yield improvement. Many mills limit the minimum acceptable random-width strip to 3/4 inch for these reasons. Some operations avoid generating narrow strips by ripping a wider random-width strip, as shown in Figure 1c. Yield of parts is increased to 90.6 percent, a 3 percent yield increase over examples 1a and 1b. 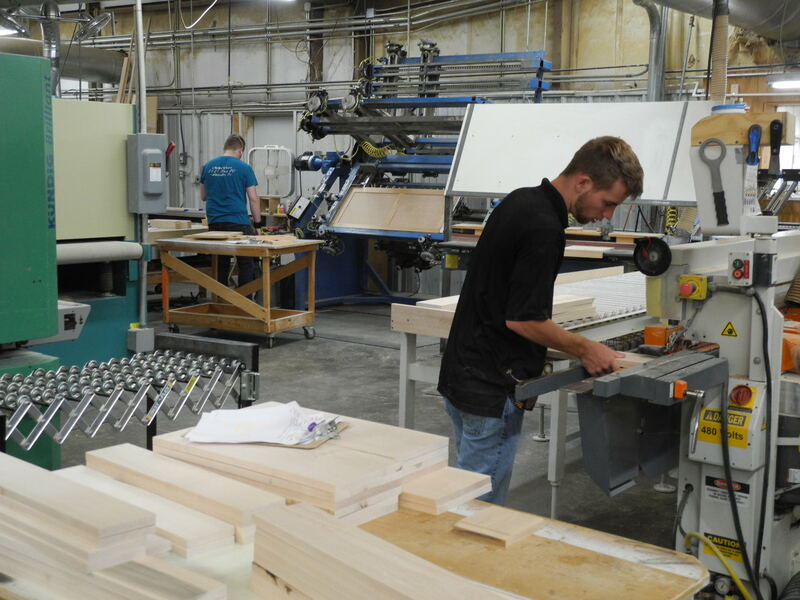 Remember, each saw kerf reduces solid wood to sawdust. It may not be necessary to machine both edges of fixed-width solid parts since it will be further machined by the moulder. Consider the example in Figure 1c; additional yield is obtained by not ripping the outside edge of the fixed-width part (omitting rip 1). This assumes the board is reasonably straight to start with. By not ripping the edge we can shift the fixed-width part's position and increase the random-width strip's width by the kerf thickness (3/16 inch) to 3-3/8 inches. The yield of usable parts is now 93.7 percent, and we reduced the number of rip cuts required. Example 2: Board sections to be cut at the ripsaw often are not as clear as in the previous example but contain defects that need to be removed. The board section passed on to the ripsaw from the crosscut saw in Figure 2a is again 6 inches wide and contains a knot, an area of stain and wane along the length of one edge. Again, 2-1/4-inch-wide fixed-width and random-width parts are to be cut. As shown in Figure 2b, the first rip removes the wane and straightens the edge. The second rip straightens the other outside edge. The third rip produces the 2-1/4-inch fixed-width part, while the fourth and fifth rips remove defects and generate two random-width strips. The yield for this ripping option is 67.7 percent. Figure 2b illustrates good ripping practices: The edging strips were minimized and the kerf was placed into the defect, maximizing the amount of good, clear wood available. Alternatively, figure 2c shows poor ripping practices as exhibited by the wide edging strips produced and the placement of the kerf totally outside the defect area, wasting usable wood around the defect. In the properly ripped board (Figure 2b), 67.7 percent of the board is converted to useful parts, while in the poorly ripped board (Figure 2c) only a 54.2 percent yield results. For completeness, example 2d shows how ripping wider random-width parts in lieu of fixed-width parts increases yield and reduces the number of narrow strips produced. Example 3: Figure 3a presents a board in which the defects may not permit fixed-width parts to be cut. In Figure 3b, the first two rips straighten the outside edges and remove the wane located on one edge. Subsequent rips bury the saw into the defect area and produce three minimally acceptable random-width strips (each 3/4-inch wide) with straight edges ready for edge gluing. Strips containing defects can be sent to the salvage saw, typically a small crosscut saw used to remove defects and produce shorter parts. Possible salvage saw cuts are shown as dashed, vertical lines. Operators must know what defects are acceptable. It's essential that ripsaw operators (both infeed and off-bearer operators) know and understand their end product requirements. When training operators, management should establish and write down quality criteria. In establishing quality standards, it is important that operators understand that the standards can vary according to species, and according to the product's design and finish, and according to customers. Management needs to communicate quality standards to operators on a regular basis. One method is the use of sample boards with representative defects illustrating different grades. Minimize edge allowance. The traditional amount of extra width added to moulder stock for sizing rough mill parts is 1/4 inch. Consider reducing this allowance. Some manufacturers have reduced moulder allowance from 1/4 to 1/8 inch for shorter moulder stock (less than 24 inches) and to 3/16 inch for longer stock (more than 24 inches). Consider a part whose rough size is 1-3/4 inches and is machined at the moulder to a width of 1-1/2 inches - i.e., an edge allowance of 1/4 inch. Reducing the allowance from 1/4 to 1/8 inch recovers an additional 1/8 inch for every part machined. Operators also can reduce edge allowance by using the splitter saw at the moulder to separate multiple-run parts. This substitutes one thin kerf produced at the moulder for two (often wider) ripsaw kerfs. Avoid producing oversized parts. Rough mill parts are commonly manufactured 1/16 inch wider at the ripsaw than specified by the route sheet. Ripsaw operators may do this to ensure that parts are wide enough to meet moulder requirements and thus avoid a shortage caused by parts that are too narrow. This is a prime example of how important it is for everyone to understand how they can influence cost and profit. For example, if a 2-inch wide part is manufactured only 1/16-inch oversize, this represents a 3 percent yield loss.